American Chop suey as I knew, wasn't so complicated nor had so much history to it. It was simply a dish we used to enjoy while dining out in the popular Chinese restaurants in Madras during the 90's. I know it sounds ancient. Well it was almost couple of decades ago and that's when our food scene was taken over by the pizzas, paneers and pan Indian cuisine. While on one hand you were tempted by Western food, your kitchen was invaded with indo Chinese foods like the Fried rice, Manchurian and Hakka Noodles. Apart from all there were featured what was so famously known as the American Chopsuey. 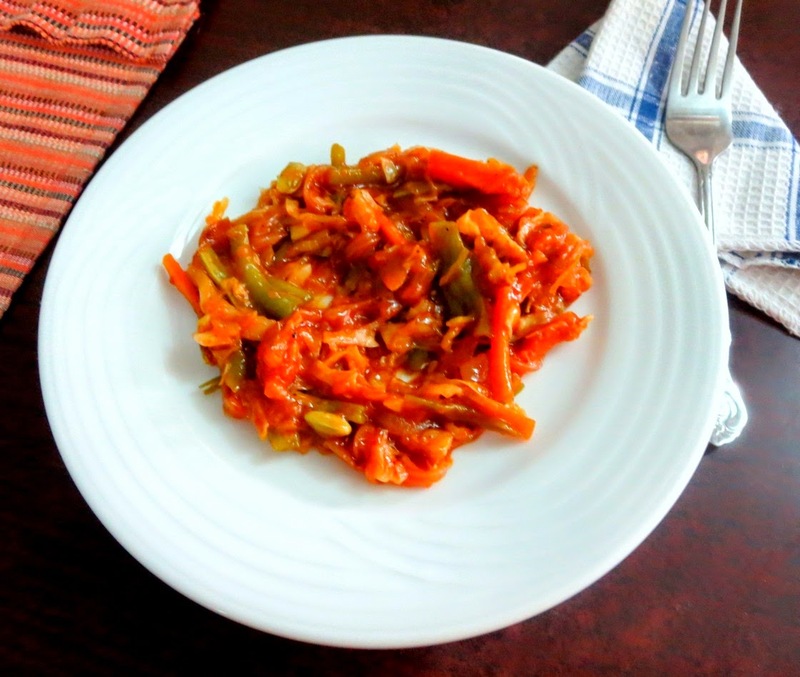 This was one dish we always used to order and after a while started making it at home. 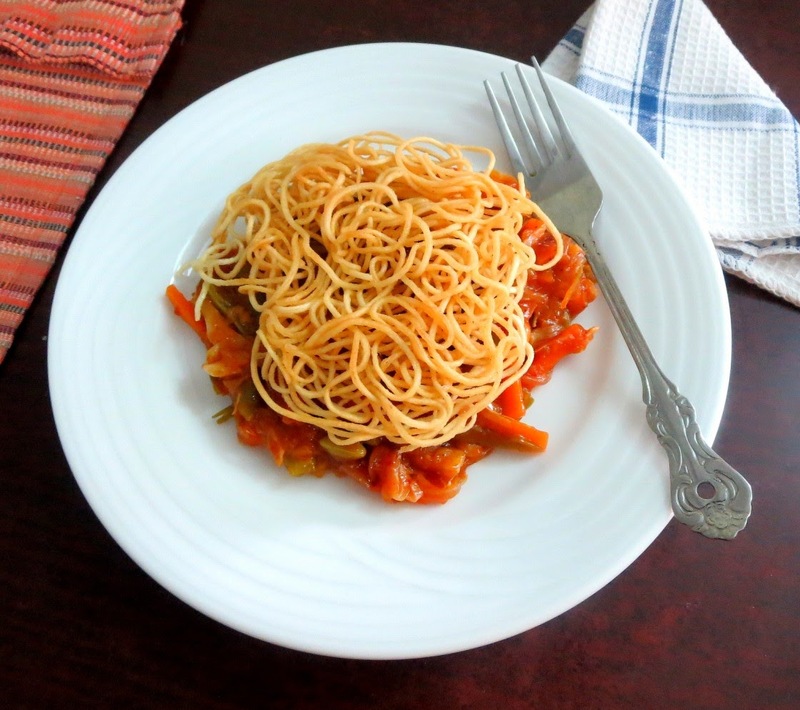 A typical American chop suey is supposed to be a non vegetarian dish with pieces of meat in it along with vegetables and stir fried noodles. 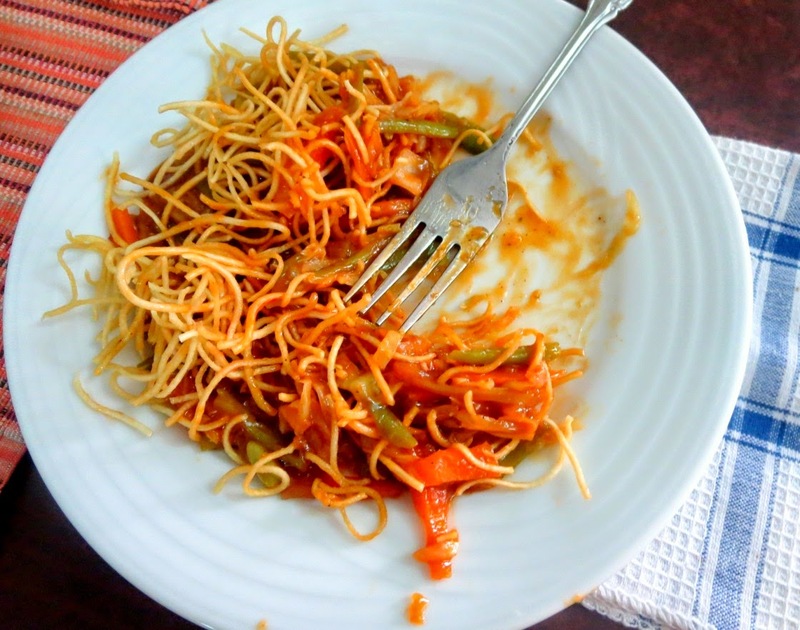 However the version I remember eating and later making at home, was always with fried noodles on a bed of thick sauce. Well adaption heavily done, to suit our own taste. Hubby dear is not very keen on Chinese and whatever I used to make was a fusion and more like an Indo Chinese version. So this dish never came around to be made in recent times. This was the dish that promoted me to include the Noodle in the list and I was so glad that I finally made it again after so many years. 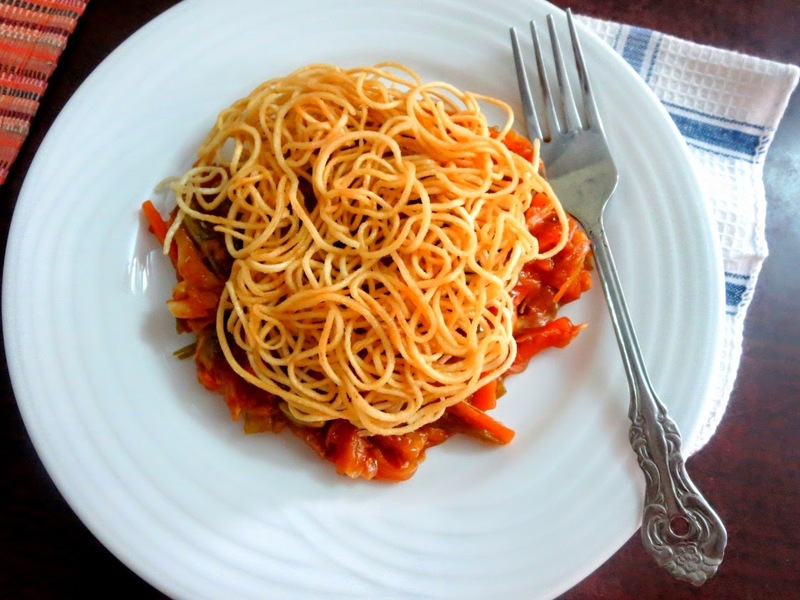 It has vegetables, sauce and fried noodles to satisfy your taste buds. And from what I remember, the fried noodles are simply served on top with another sauce poured over it. Some places serve it with the fried noodles mixed in. I don't like that way and mostly used to serve with fried noodles on top. so that's how I did this time and parents were so nostalgic after eating this. We decided to have another noodles day soon. On another note, I wonder what kids these days will remember back on their growing up years and become nostalgic. They are exposed to everything at early age, whereas it used to be done at much later years for us. Maybe they will discovery Dal Chawal Subzi and might tell their kids about how they first ate this during their growing up years! Noodles in a cutlet, Noodles in a soup, for today it's Noodles fried and over a sauce! When the noodle is done, you can press it between your fingers to see if it is done, make sure it's not hot, the noodle should be soft but not very soft. 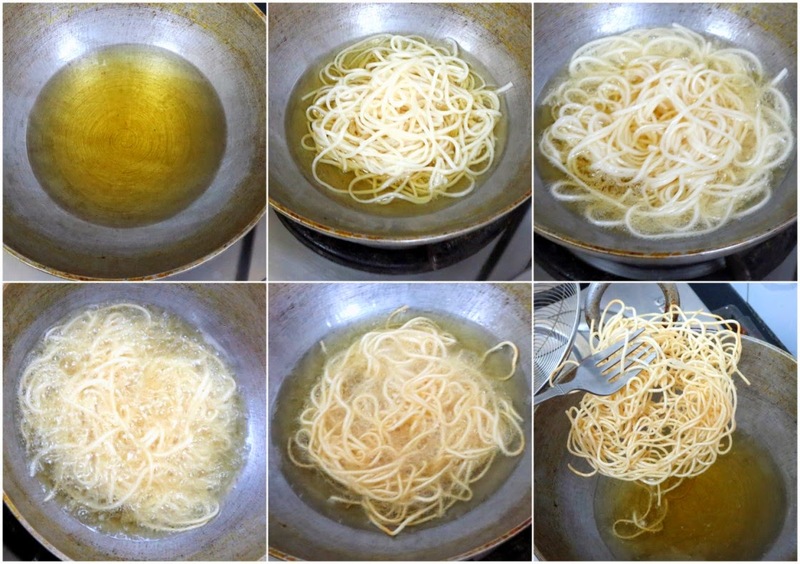 Once the noodles are boiled and dried, heat a pan with oil. Once the oil is hot, drop in a cup of noodles and cook on high. When the noodle becomes crispy, drain and keep it aside. Boil the noodles as per the above details. 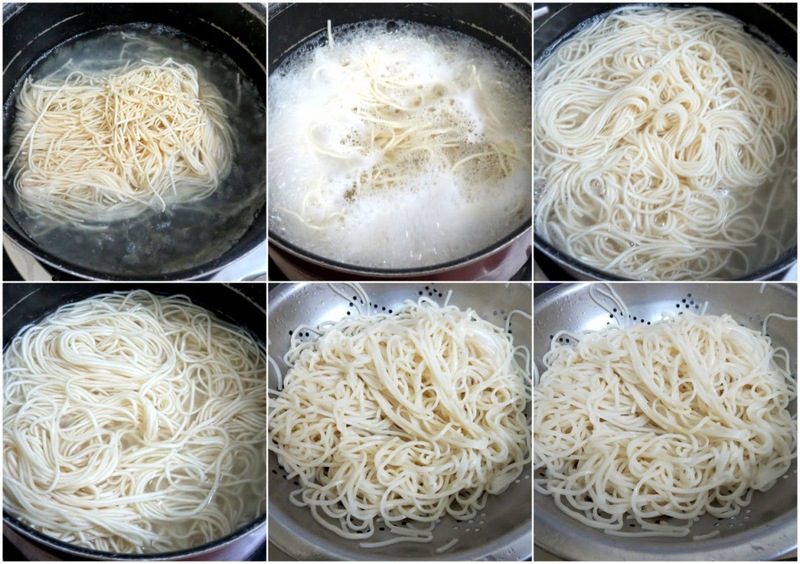 Once it is cooled down, heat a pan with oil and deep fry the noodles on both sides. Drain and keep it aside. Make a liquid paste of corn flour with water and keep it aside. Chop carrots, beans as julienne, par boil in MW for 4 mins. 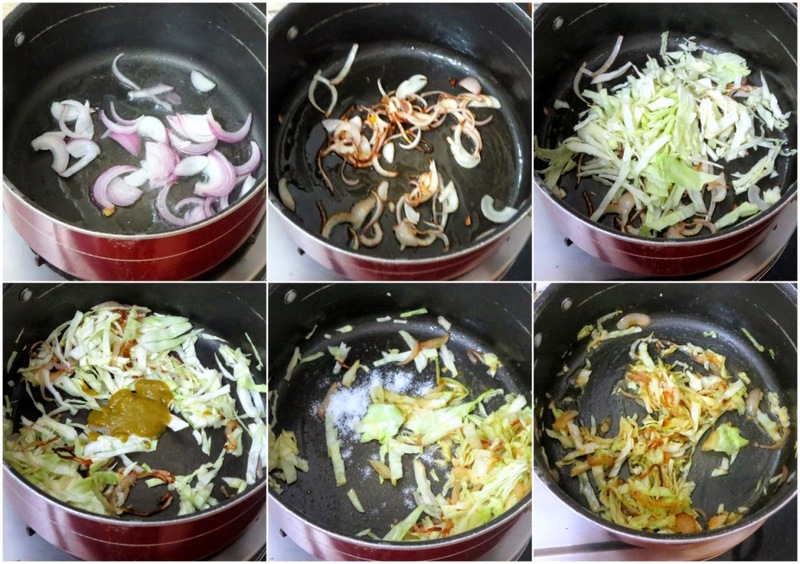 Heat a non stick pan with oil, sauté onion julienne on high flame. Then add shredded cabbage, quickly toss around. Next add the carrots, beans and cook for 2 minutes. Once the vegetables are mixed well, add the soya sauce, salt, corn flour mix and tomato sauce. Combine everything and cook on simmer. Once the sauce is almost thick, switch off and transfer to a serving plate. Place the fried noodles on top of this and serve hot. The vegetables in this has to be little crunchy, so don't overcook in the beginning itself. You can also crush the fried noodles and mix in the sauce. 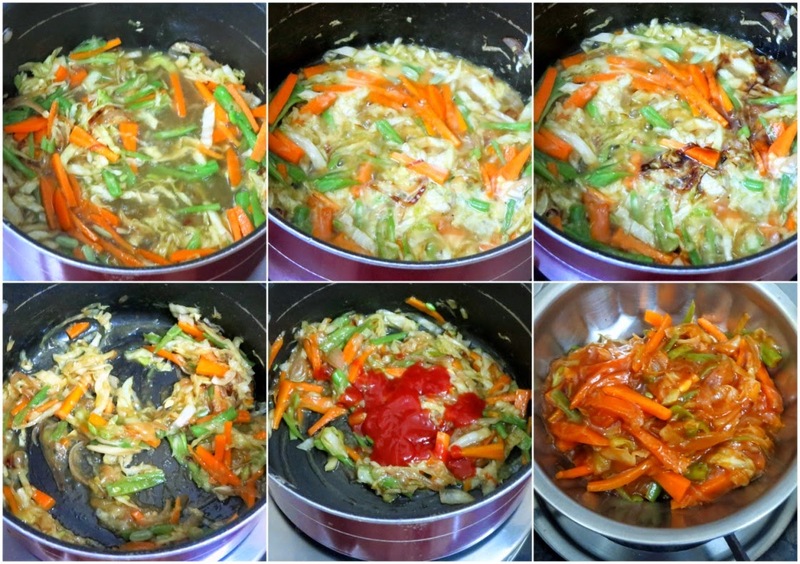 Else you can make a sauce with soya sauce, corn flour, and add to the pan fried vegetables with sauce. This needs to be served when eating, as otherwise the noodles will get soggy.